Organic Peroxides are unstable chemical compounds which decompose at relatively low temperatures. With the correct precautions taken they can be stored safely. The prevention of undesired decomposition reactions during storage requires knowledge of the peroxide and its general properties. Personnel who have been trained and understand organic peroxides will be able to handle the chemical safely. Minimisation of a peroxide decomposition. Reducing the effects of such a decomposition. The following is a guideline to minimise the probability of a peroxide decomposition by limiting the heat exposure of the product and preventing contamination. Recommendations will be given below as well as specific measures for temperature controlled products. These recommendations are based on Chemstore’s experience and knowledge.There are also insurance and local regulations which must be taken into consideration in the design and construction of storage units. 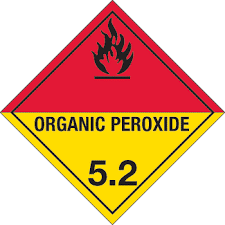 Organic peroxide is thermally unstable due to the weak bond in the molecular structure. As a result organic peroxides are heat sensitive and will decompose significantly above a certain temperature. This temperature is specific to each individual peroxide. During its decomposition heat is released and the rate of its decomposition increases with temperature. If this heat cannot be transferred to the environment due to a reduced surface area from stacking or high ambient temperatures, self -heating will accelerate and lead to a violent combustion or thermal explosion. Every peroxide has a temperature at which the self-heating accelerates. This temperature is designated as the SADT – Self Accelerating Decomposition Temperature. At or above this temperature a reaction will take place. Due to this, temperature control and high temperature alarms are required for storage. However for a longer shelf life, lower temperatures than the control temperatures are generally recommended. At this recommended storage temperature (Ts) as indicated on the product label, the product will be stable and quality loss will be minimal. The temperature must be maintained at or below the recommended storage temperature, refer to the SDS or product data sheet. Organic peroxides must be protected from direct sunlight and all other sources of heat. Heating systems (radiators, warmwater pipes etc). Cooled storage rooms should be provided with at least two independent temperature alarms. An alarm is recommended when the storage temperature is exceeded by 5⁰C. If this is the case the store should be inspected. The temperature alarm should incorporate a delay device to allow for intermittent short temperature increase which result from inspection, loading and unloading. Any possibility of alarm de-activation should be countered with an automatic alarm re-activation. Non-cooled storage rooms should be provided with an alarm set at the emergency temperature but not higher than 45⁰C. it is important that a signal from the mentioned alarm system should not escape notice at any time including nights, weekends, etc. and that appropriately trained personnel are alerted. There should be dual power supply for the alarm system. The floor should be seamless, easy to clean and made from a non-combustible and non-absorbent material. A slight slope is recommended. This will direct liquids and allow for easier clean up. Extreme caution must be taken when collecting this liquid to prevent trapping of organics peroxides. 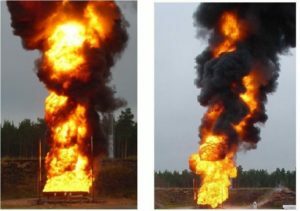 As fire fighting water may carry peroxide, it should be directed into a sump area underneath the floor with a provision for emptying. Drainage systems should not be in direct contact with the site sewer system to allow control of the peroxide. Fire fighting water can carry burning peroxide with it as it drains away. Observe local regulations with respect to containment of fire fighting water. A storage building should be adequately provided with lightening protection. The colour of the store externally should be light in colour. Construction materials should be compatible with organic peroxides or coated to prevent contamination. Ventilation openings should be covered with grilles and be at least 1% of the walled area. Placement of organic peroxide stores with respect to essential equipment or services, buildings, roadways, waterways etc. must be considered. 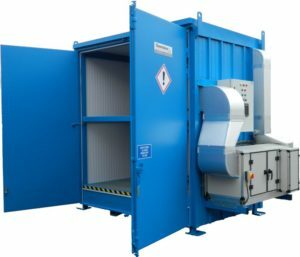 There is no definitive distance stated but typically a distance of 10m for the storage of 1 ton and 20m for the storage of 20 ton of organic peroxide. Local regulations must also be considered. Walls, roof and door(s) should be insulated. The insulating material should be non-flammable or flame-retardant. To avoid absorption of moisture and to retain the insulated properties, non-absorbent material (closed cell structure) should be used. The material should be resistant to solvents used in the products to be stored. If the insulating material is not solvent resistant it should be covered with a cladding material. Any equipment including the cooling unit that may generate heat or sparks should be located outside the storage building, away from the entrance so as to reduce the electrical requirements. Any electrical equipment having direct contact with the inside air should be explosion-proof. Moving parts and openings should be protected from becoming icebound by atmospheric moisture. In contrast to non-cooled storage, there should be no ventilation openings in the door or walls. If fresh air ventilation is required, the following items should be considered. The replacement rate should be minimised. The outside air intake must not be allowed to warm up the stored peroxides. If a sprinkler system is required it should be a dry type system.